During the last few days we have seen some big Spring fish caught on the Ness system at 25lb and 20lb; Spey at a estimated 27lbs and the Tay at 26lb. Now fish are staying out at sea longer, can we expect to see more leviathans caught during the coming months? Will you be this year's Malloch Trophy winner? 26lb fish caught Monday on Meikleour Fishing by Dario Ferrari. We would like to thank the ghillies, boatmen and angling clubs across the FishPal site who update catches and telephone in with good news and photographs of their customers with fish. There are over 800 fisheries on the site and we would encourage everyone to share their catches and news to keep our sport shining brightly. We have been asked why did we have to change sites? The old site was based on databases and code developed nearly 20 years ago and which are no longer supported by their providers, nor would they run on the modern server platforms we needed to move to. Also the old web page design did not work well with many mobile phones, which are now the majority of devices using the site - read more. If you haven't updated your browser recently, you may have problems with the modern code we are using and the layouts may look odd - read more. The System Status page has a form for reporting any new issues to us and an update on issues we are still working on. Please help us by using this form rather than emailing us direct. Just one of the 539 salmon flies available. Caledonia Fly Company have added more salmon flies to their collection. They can now offer the retailer the largest range of salmon flies anywhere in Europe. The first of the new flies is the Friggi Fly range. They have been designed to have as much movement as possible. 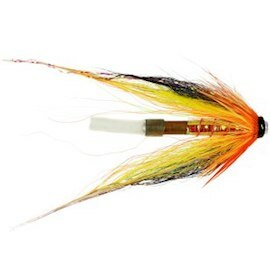 These V or arrow shaped flies are new to the UK market place but have been a hit in Iceland for a few years - read more. It's been the best start on the River Don for quite a few years. Anglers have caught a dozen mostly liced fish from various beats on the lower river as far up as Alford. ADAA beats at Kemnay and Lower Fintray have reported fresh fish to 14lbs. 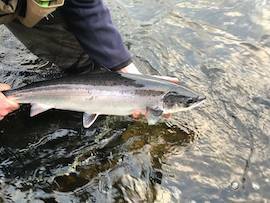 Further up at Inverurie, anglers have again seen some fantastic salmon landed - read more. The Don is also a trout river and is regarded as one of the best by many angling journalists. The Don is one of Scotland's hidden gems - find fishing. Are you interested in learning to fly fish or looking to improve your techniques? Then the following courses are for you. River Tweed. Tweedguide are holding fly fishing schools for salmon, brown trout and grayling on the river Tweed during April and May. Tuition, permits and equipment is included within the cost - read more. River Tweed. 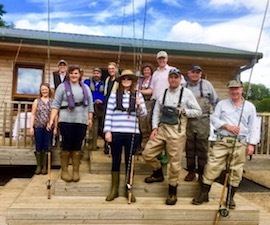 Lower Pavilion are hosting a 3 day salmon and a 3 day/evening sea trout course during August. The price includes fishing permits, tuition and equipment. All levels of ability are catered for - read more. River Tweed. FishPal's Anne Woodcock and Orvis Kelso are holding a ladies fishing morning this coming Saturday March 9th from 10am - 1pm. River Tay. One place has become available on the Spey Casting Course on Friday 15th of March with Tom Brown, Greys Pro Team Instructor. Please contact Meikleour Fishing for details about all their courses. River Tay. Casting instructors Andrew Toft and Iain Kirk are hosting a series of Spring, Summer Spey-casting and fishing courses on FishPonds beat on the Tay. The courses are aimed at both beginners and those keen to enhance their technique. Instruction will be tailored to suit each individuals requirements and skill level - read more. 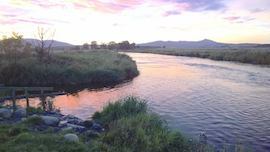 River Nith. AAPGAI have a open day on Saturday 16th March at Friars Carse Hotel - read more. The 2019 Maxton Fishing Syndicate has the following available. Tuesday half a rod (one day every two weeks). Thursday full rod or two halves (full rod is one day per week). Friday one and half rods and Saturday 2 full rods. Please contact Tom Carter on 01573 470612 or email tom@fishpal.com for more information. River reports. You can find every river report under the section called 'Latest' on the FishPal homepage page. The Dee ended the week on 18, with fish caught from Park up to Dinnet and Deecastle. Lower Crathes and West Durris picked away with seven. Arni Baldursson was back in action and was soon into a springer on Monday morning. He had two for his short trip. Phyllis Atherton also had two, as did the ever-reliable Geoff Fisher. Paul Grewcock made his usual contribution, landing a belter of 16lb - read more. The Spey ended the week with 25 fish landed that we have heard about. Easter Elchies landed four or five. Kinermony had a couple. Rinnes Brown caught a fish measured at 41" and estimated at 27lbs. The warm water has spread the fish out and those beats that are being fished have been rewarded - read more. The Tweed finished the week on 42 salmon, with the best fish for the week a 16lber caught on Sprouston beat. The bulk of the catch does still seem to be below Kelso but I have heard of reports of fish been seen up the middle river. Rutherford got off the mark on Saturday with a lovely 9lb fish after having a couple of fish shake the hook at the bank in previous weeks - read more. Marina Gibson opening the Cargill fishing hut on the Tay. 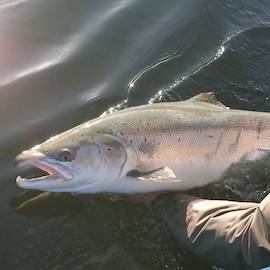 The Tay finished the week on 24 salmon, with the largest fish reported on Islamouth at 16lb. This has been the best week of the season so far with fish caught as far up as Upper Farleyer and Upper Bolfracks beat. The river produced 48 fish in February of which 24 of them were caught last week - read more. 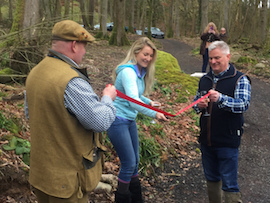 Mark Cockburn was out on the Tay yesterday at the opening of the new fishing hut on Cargill beat - read more. We say it every week. A days salmon fishing during the next few months starts from as little as £20 a day for an adult and £6 for a junior - find fishing. River Don. Fishing permits have been added for salmon and trout on Moonhaugh and Bandley and Waterside beats. River Findhorn. Salmon fishing permits have been added for Glenferness Estate - read more. South Esk. Cortachy beat on the South Esk now have fishing permits online until August - read more. Argyll. Classic west coast spate river Ruel has just added availability for Kandahar beat - fishing permit. River Ness. Salmon permits have been added until the end of the season for the popular beat, NessSide - read more. 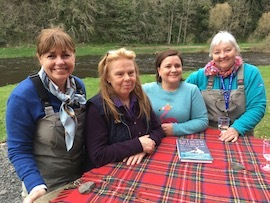 FishPal and Bemersyde Fishing joined Scottish Comedian and Strictly Come Dancing Celebrity Susan Calman for her latest program Secret Scotland. Did she waltz her way down the Tweed? Watch the programme again here. We appreciate that many of you fish multiple rivers and are constantly checking levels and catches to help you determine where you want to go fishing. The new site now offers you the flexibility to see the latest catches and river levels in one click. All River Levels can now be viewed on one page. The colour coding quickly gives you an indicator on the status of the river. Red for rising, yellow for steady and green for falling. To access more stations on your chosen river just click onto the highlighted river eg Annan for Annan. Behind each river station name we have the levels in feet for the past 24 hours and 28 days. Once you have looked at the individual river level or catches page you may want to book a fishing permit. It's now even easier. On the left hand side of the page you will see find fishing along with places to eat, where to stay, tackle advice, guides and much more. If you don't want to fish that river you can just go back to the header and click on Rivers or Latest. Here you will find the most update information on catches and river levels anywhere in the UK. Please note we are not in a position to post your photos if the fish is on the bank, grass, stones etc. Ideally keep the fish in a net, in the water or as near to the waters surface if possible.